* You can't spin this one... It would seem that the Met may have larger money troubles than previously reported, and who DOESN'T in this economy? In a last ditch effort to raise some capital, the Metropolitan Opera has mortgaged the great paintings that hang in the front lobby of the building. 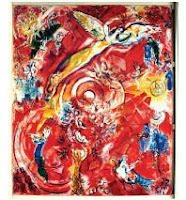 The Marc Chagall paintings titled The Triumph of Music and The Sources of Music, were commissioned for Lincoln Center when it was new. Now, they're collateral for cash. Erica Orden of the New York Times reports: "Met spokesman Peter Clark confirmed the news, saying that “the Met has had a long-term loan for a number of years which relied on cash holdings as collateral. The Chagalls are now being used as partial replacement collateral in order to free up some of the use of the cash.” (A source says the Chagalls were appraised at $20 million.)"